When National City is seemingly attacked by a member of a normally peaceful race of alien telekinetics, it raises a lot of eyebrows at the DEO. When the hunt for the suspected terrorist discovers only one scared little boy named Marcus, it will fall to James Olsen to be The Guardian he dreams of being. The 2008-2009 crossover event Superman: New Krytpon. Why doesn't J'onn use his telepathy to try and talk to Marcus? You'd think having another telepath "speak" with him might be comforting. You'd also think that J'onn - being a father of two - might have some idea how to comfort an upset child. Or to at least have better sense than to lock a traumatized child up in an interrogation room! The special effects work for the various telekinetic attacks is great. The final shot of the Daxamite ships hovering over National City is a visually stunning one. The episode title comes from a 1995 science fantasy film, which is set in a dystopian future where a mad scientist tries to steal the dreams of children in an effort to become immortal. When James is talking to Winn about how he's scaring people rather than being a beacon of hope, he refers to "Clark's friend" and Winn says he always thought they were more frienemies, it's pretty clear that they are talking about Batman. This is yet another subtle hint that Batman does exist on the Earth of Supergirl. Lena says that her brother Lex is being held on Stryker's Island. In the DC Comics Universe, Stryker's Island is a maximum security prison located on an island in the West River near Metropolis. It is modeled on the real world prison Riker's Island, which is located in the East River near New York City. James makes reference to owning the same model of camera used by Spider Martin. James "Spider" Martin was an American photographer best known for his work chronicling the Civil Rights Movement, particularly Bloody Sunday and the aftermath of the Selma and Montgomery marches. Lena's secret project has something to do with quantum entanglement and polyatomic anions. The reaction of the polyatomic anions is meant to start the generator for the L-Corp portal. The ultimate goal of the portal - from Lena's perspective - is to eliminate famine and the need for fossil fuels. The DEO has the ability to scan Earth's orbit for satellites and alien ships. Lena ultimate tries to fix the generator by increasing the anion input without overloading the energy output, all while maintaining the element synthesis rate at a constant. The DEO has a cell equipped with a telekinetic dampener. A major shift in atmospheric energy can alter a Phorian's mental state, resulting in a loss of telekinetic control. Winn developed a portable telekinetic dampener. Rhea has a White Martian device that was used to pacify Green Martians by trapping them inside a nightmare. She uses this to neutralize J'onn. James: That woman was more afraid of Guardian than she was of her attackers. James: No, dude - you didn't see her. Winn: I'm sure she was in shock. James: Yeah, but it's bigger than that. It's... it's happening a lot. People see this big guy in this scary mask and they freak out. They run away. Just like Clark's friend. Winn: Oh, you mean...? (holds up a finger on the side of his head) I feel like they're more frienemies. James: You know what I mean. It's just that Guardian's not... he's not this beacon of hope that I thought he would be. I mean, basically all I'm doing is beating people up. Winn: No, dude! We are doing a lot of good here! We're making a difference. James: Superman and Supergirl - they're making a difference. They're changing hearts and minds. They inspire people. Guardian inspires fear. Lena: Was it me throwing it down in disgust or the sparks that gave it away? Kara: Did you rip the seat off the toilet in my loft again and now you're just bringing me Chinese food so you don't get in trouble? Mon-El: That was once! That was one time! And in my defense, you are scary when it comes to enforcing bathroom etiquette. J'onn: Look, I know what I said earlier on but we could really use your help here. It has to be you. James: Why? Because I'm black? You look the same as he does too. Why don't you talk to him? J'onn: It's more than that. He sees something in you. James: I brought him to CatCo and I risked everybody's safety. Supergirl had to come save everybody. Me. Him. She kept everybody safe and I... I had no idea what to do! J'onn: (chuckles) You know, I remember that feeling? On Mars we were encouraged to decide our line of work when we were very young. Everyone had no problem pinpointing their futures. I didn't know what I wanted to do. I was just waiting for a sign. James: Did you find one? J'onn: My first daughter. When she came along, I finally realized I had a mission in life. I had someone who relied on me. Having her gave me direction. Protecting her made me realize that I had a gift for keeping people safe. So I, uh.. I joined the law enforcement on Mars. I became The Martian Manhunter. James: And you think me talking to Marcus would give me that kind of purpose? J'onn: I saw a reflection of myself in my daughter. I think you already see a reflection of yourself in him. (pauses) You want to find out what kind of hero you can be? Right here's a great place to start. Rhea: Everything I do, I do for my people. Everything you do for yours is to bolster your broken ego. You need this planet to worship you - the last daughter of a failed world. Because otherwise your survival means nothing. Rhea: (scoffs) No, I see everything clearly. I came here in peace, which you refused. And all of the ugliness that's transpired is because of your righteousness, Kara Zor-El. Everything that happens from now on is your doing. Every city that burns. Every nation that falls. For every child of Earth that cries out, "Why is this happening?"... the answer is Supergirl. James: I went to a school where there weren't a lot of people who looked like me. And when my dad died... it just got a lot worse. See, he was... he was my guardian. And he was the guy that made me feel safe. So after he was gone, I just.. I put up this wall. And I didn't let anybody in. Until I moved to Metropolis. And then I made a new friend. And this guy was different too. And I didn't realize how different he was. I just knew that he understood something that most people didn't. And because of that, I trusted him. And eventually, I let him in. Do you know what happened? That wall came down. Lena and Kara are both N'Sync fangirls. Phorians are a historically peaceful alien race with both telekinetic and telepathic powers. J'onn states that he was unware of any Phorians having taken refuge on Earth. The alien who James busts for buying marijuana says he needs it to treat his anxiety in the wake of his recent kidnapping. This is likely a reference to the events of 215 and Cadmus attempting to forcibly deport a number of alien immigrants. Lex Luthor is imprisoned on Stryker Island. James owns the same model camera that Spider Martin used to document the Civil Rights Movement. He bought it with the first paycheck he made selling a photo. The good news is the series finally seems to have realized where they went wrong in trying to turn James into The Guardian. The bad news is they really should have found a way to develop James as a figure of inspiration before now. 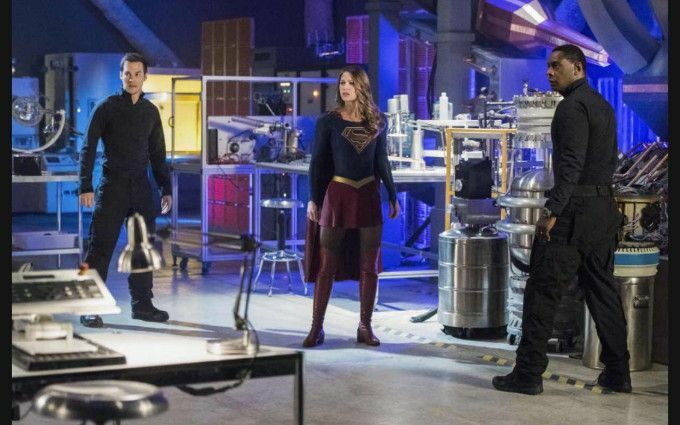 Unfortunately, all of the other subplots - from Rhea manipulating Lena by being the supportive mother she needs to Mon-El and Kara being cute together - are far more interesting than James Olsen delivering monologues to a largely mute child - no matter how well-written the speeches nor how skilfully Mehcad Brooks delivers them. As it stands, this episode feels like too little, too late.